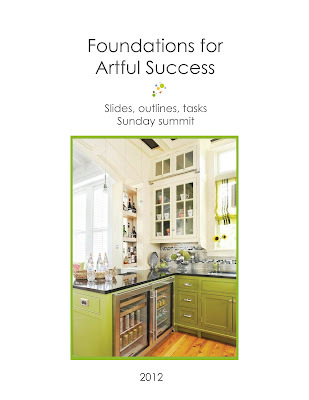 Artful Success....it's proving to be artfully successful! Best part...I have an AWESOME new Sistah Wife/accountability partner...erin. She is young and creative and adorable and talented and she has an amazing mentor and she has the exact same sense of humour as me and she has her own store and she's going to sit with me in the caf!!! (ok...so I'm crossing my fingers for that). I expect fabulous things from both of us, so too bad for Oprah that she's dumped her show cause we would have made great guests! Because everything in my life is an opportunity to fiddle on the computer for days on end (hmmmm...I think there's a module on that), I made a nifty cover for the binder that holds all of my materials. The kitchen picture is to remind me of one of the things I'm working towards this year...a kitchen reno featuring acidy green bottom cabinets. I'm not an upper cabinet fan, so just banged up walnut slab shelves will be divine. The weather has been so awesome here, and sitting in my 'window room' (the end of my dining room) listening to the classes has been uplifting. I've been in and out of the studio, but I'm working so much on little things to lay the foundations (plug, plug) that I'm not quite there yet......oh, yeah, and I'm out of sterling. Posting will be a bit sporadic over the next 2 weeks as I've got a little vacay planned, and vistors, and energy busting cleaning rituals, and foundation laying, etc.